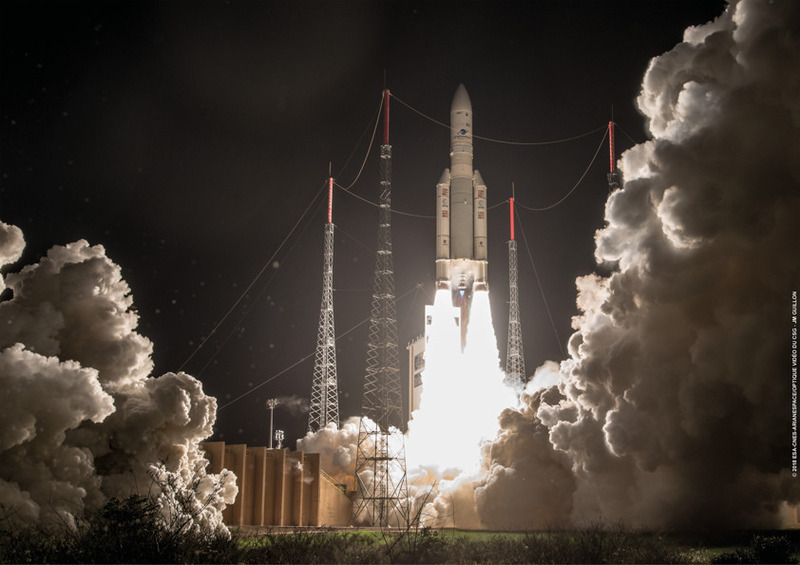 Europe’s Ariane 5 lifted off on its 97th mission at 22:20:07 UTC on January 25, 2018 from the ELA-3 launch site at the Guiana Space Center. The mission suffered what Arianespace described as a “trajectory deviation” when the 55-meter tall rocket apparently flew to an improper launch azimuth from the very beginning of its climb toward orbit. 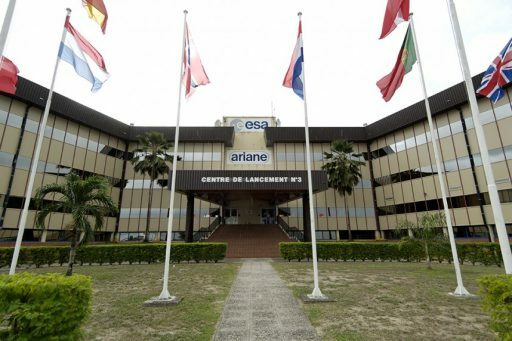 It since transpired – per reports from La Tribune and Le Figaro – that Ariane 5 launched with an improper flight program, sending the rocket on the wrong azimuth and dangerously close to the French Guiana Coast Line. The articles also report that the VA241 mission was the first time ArianeGroup, a venture between Airbus & Safran, controlled the launcher until the countdown reached zero. According to multiple sources cited in these articles, this transition came with the elimination of a double-checking of Ariane’s flight program before liftoff in an effort to reduce cost. At this point, awaiting the findings of the independent inquiry commission, Arianespace and ArianeGroup make it clear that the control policy as regards mission preparation procedures, as defined in the Quality management plans, was identical with previous launches. Figuring out what exactly transpired in what usually is a complex chain of events will be up to an expert commission set up between Arianespace and the European Space Agency. But, through a wealth of publicly available data, some interesting observations can be made. Consider this a non-authoritative work in progress. Mistakes are likely included, corrections are appreciated. 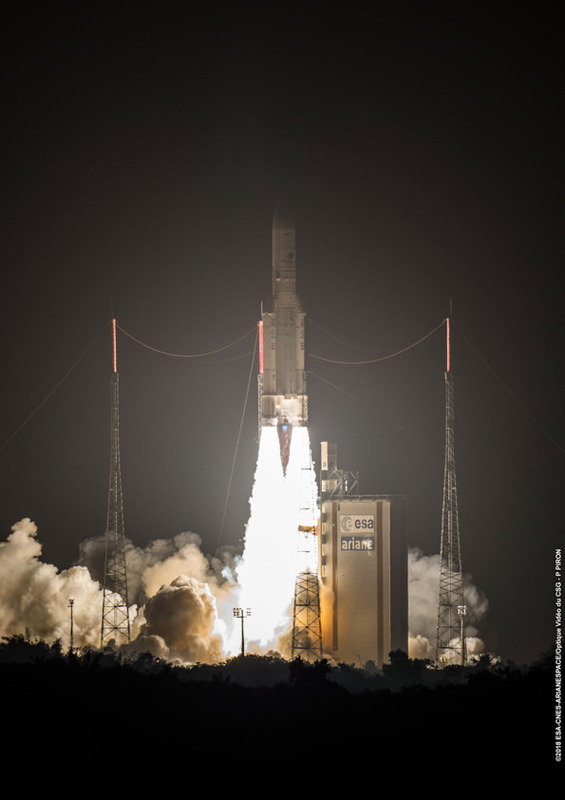 Ariane 5 VA241 was targeting a Supersynchronous Transfer Orbit of 250 x 45,000 Kilometers, inclination 3.0°. In addition to a major error on inclination, the trajectory deviation also caused the perigee and apogee positions to drift away from the equator, requiring the satellites to rotate their orbit which comes at the additional cost of maneuvering propellant. 2. CANCEL THIS MSG 250107Z FEB 18. Per the NOTAMs for the EAPs and previous missions with similar performance, Ariane 5 VA241 was targeting a launch azimuth of approximately 92.4°. Other information suggests a straight eastward azimuth of 90° which would also fall into the identified EAP splash area. This yields an approximate flight azimuth of 111°. However, the map’s resolution leaves much to be desired and can therefore only provide a coarse estimation of the azimuth. More accurate data can be obtained through analyzing photo and video evidence. 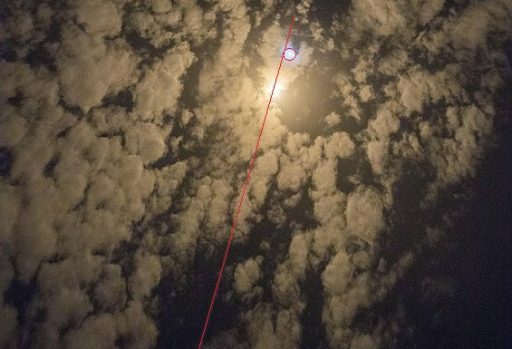 In addition to the known position of the photographer and the Moon, the altitude of Ariane 5 at the moment it scratched past the Moon is needed. This value can only be estimated as no altitude profile was released for the VA241 mission. 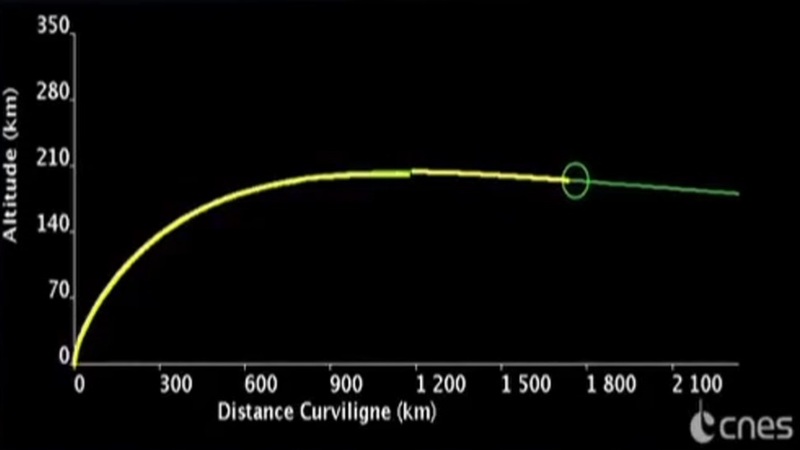 Luckily, Ariane 5 missions only differ marginally in attitude and altitude profile for the EAP phase of the mission (zero-angle of incidence flight profile) and the mass of the payloads makes only insignificant difference to the vehicle’s initial climb out. 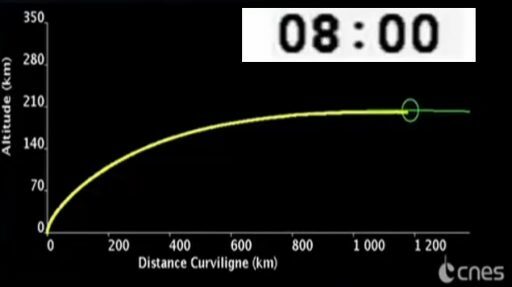 Based on review of past Ariane 5 launch videos where altitude information for the time in question was shown, the vehicle passes 18 km in altitude at H0+1:18, though an error bar of one Kilometer is appropriate in this scenario. Also, the Moon in the still image is overexposed, making it difficult to determine whether Ariane definitely skimmed the lunar disk. An error bar of one lunar width (0.54°) appears reasonable. 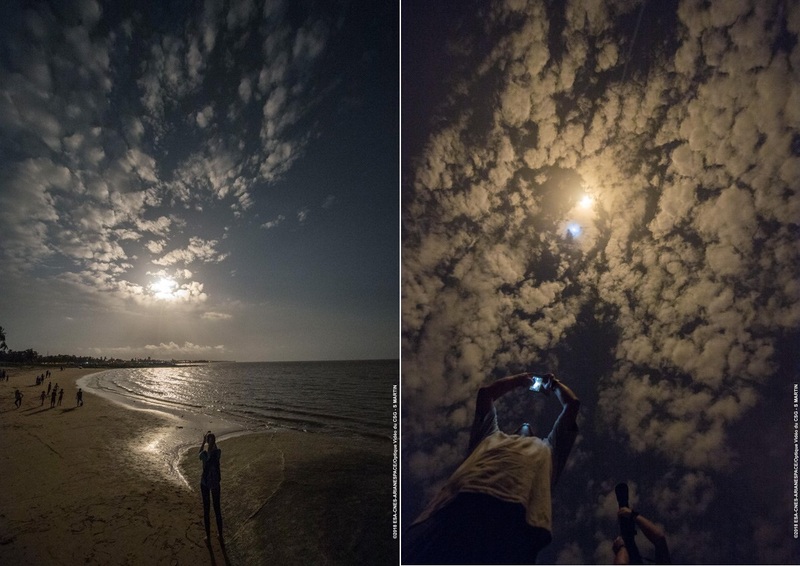 A calculation using the known position of the ELA-3 launch pad, the photographer’s location and the position of the Moon yields an approximate launch azimuth of 112.4° ±0.6° – in surprisingly good agreement with the crude approximation through the trajectory map. This azimuth is 20° south of the planned VA241 azimuth. Two additional videos (embedded below) appear to be taken from or near the IBIS Observation Site at 5.163°N, 52.679°W. Vast overexposure of the Moon & exhaust plume in the IBIS video and uncertainty in location for the other make the calculation of launch azimuth difficult. 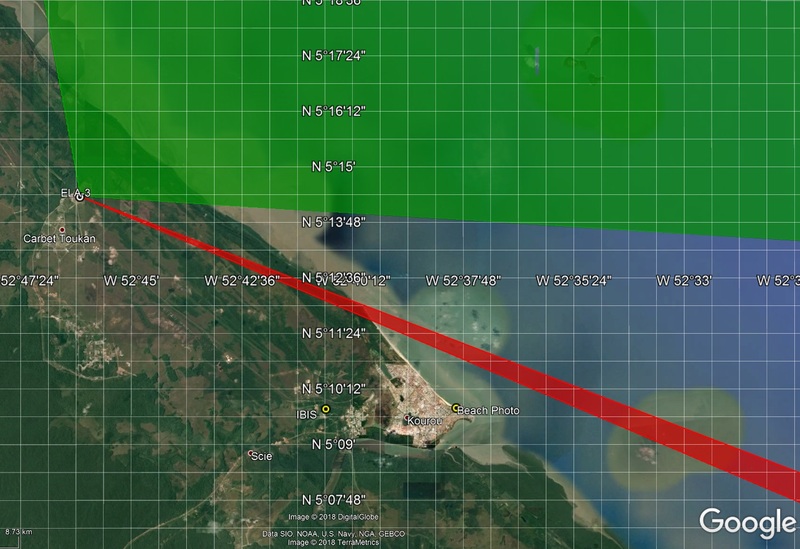 Assuming a position near IBIS for the second video, the launch vehicle appears to be at an elevation of 76° when passing the Moon’s azimuth, corresponding to a flight azimuth around 112.5° – but the margin of error in this assessment is at least three lunar widths. Another way to constrain the actual launch azimuth of the VA241 is through the achieved orbit parameters. Unfortunately, Ariane 5 does quite some maneuvering during ascent driven by two factors: a) setting the EPC Core Stage on a safe trajectory toward an ocean impact and b) to optimize the orbit of the satellites. In typical Ariane 5 missions with similar performance and inclination constraints (VA203, VA210), the EPC’s sub-orbital inclination ends up higher than the launch site latitude (between 6.8 and 7°) while the ESC-A was to reduce the orbital inclination to 3.0 degrees. Assuming a straight-line launch into the achieved orbital plane at an inclination of 20.64° (which is not representative of reality) yields a launch azimuth of 111.3°. Taking a lower boundary of 111° and an upper boundary of 113° places the rocket’s ground track no closer than 1.1 Kilometers to the town of Kourou. 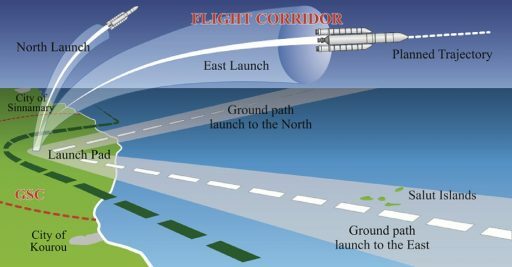 One obvious question arising with an orbital launch vehicle flying some 20 degrees off its planned trajectory is whether range safety criteria were violated. 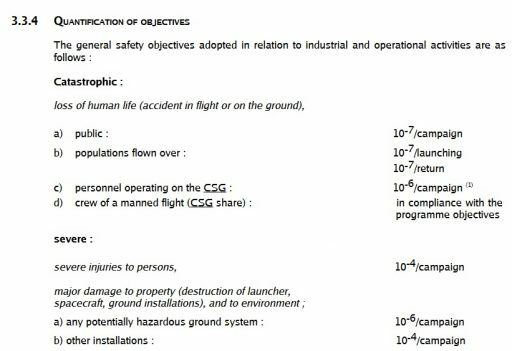 Unfortunately, getting a firm handle on range safety criteria and procedures for the CNES-operated range at CSG is somewhat difficult. 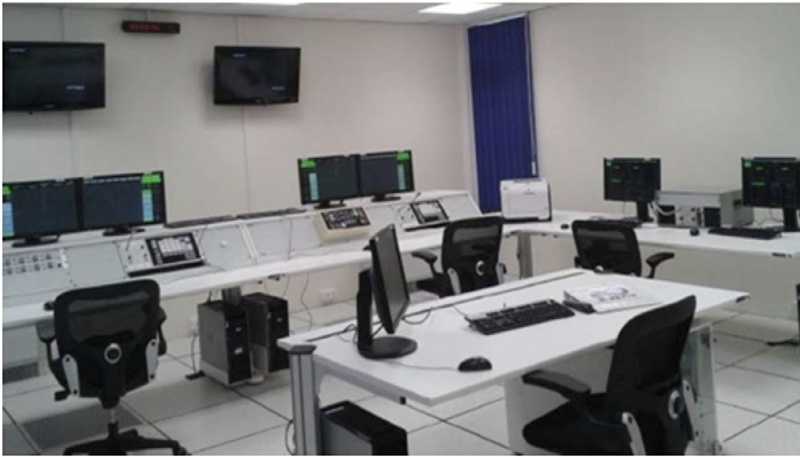 The March 2017 paper provides an in-depth overview of Range Safety Requirements and Procedures at the Guiana Space Center and further elaborates on human factors regarding Range Safety Officer training & certification. This map of the CSG Range shows why VA241 – if the azimuth calculations presented above are reasonably close to reality – was a borderline case. 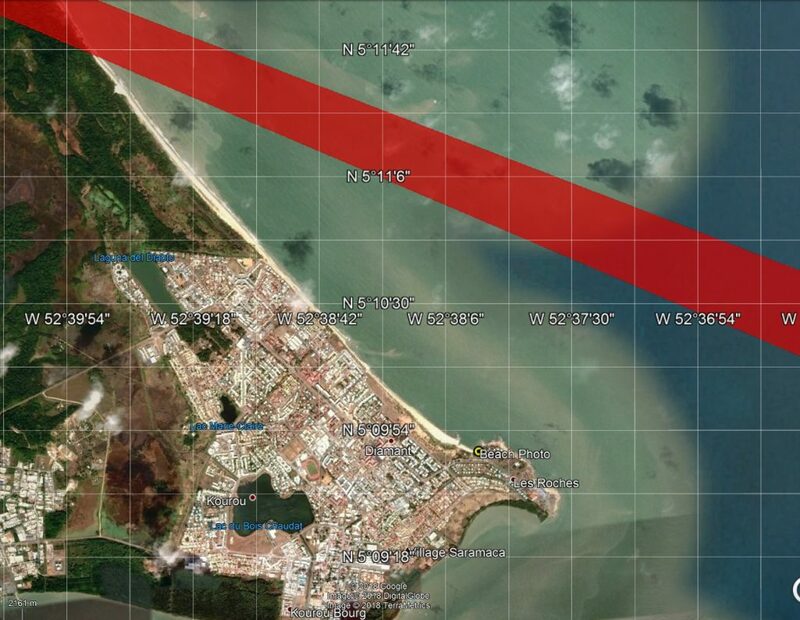 For any azimuth smaller than ~113°, the launch vehicle would violate its qualified flight corridor but remain outside the safety area established for the town of Kourou to the south and Sinnamary to the north. Based on the failure mode encountered by VA241, the rocket’s performance in the vertical plane would have been perfectly normal, but the horizontal display (fed by data from three radars during the first 80 seconds of flight plus onboard navigation sensors independent from GNC functions) would have made the deviation evident within the first 15 seconds of liftoff when the vehicle would have been well in the process of pitching on its improper launch azimuth. The display of “nominal trajectory, actual trajectory, and alert and safety limits” would have provided the range safety team a real time assessment of where the launcher was headed and whether the limits of the safety area would be violated. Telemetry Officer: Monitors relevant vehicle parameters to assess whether an onboard failure is occurring (propulsion, separation events, onboard computer & GNC status, onboard flight safety algorithm, and telecommunications link). Deputy Safety Officer: Manages the localization facilities, monitors the launcher trajectory and warns the Chief Safety Officer of any trajectory deviation. Chief Safety Officer: The only member with destruct authority, he manages telecommand facilities, confirms the trajectory deviation, compares it to the flight corridor and sends the flight termination telecommand if needed. Backup Operator: On stand-by to replace any of the three positions. 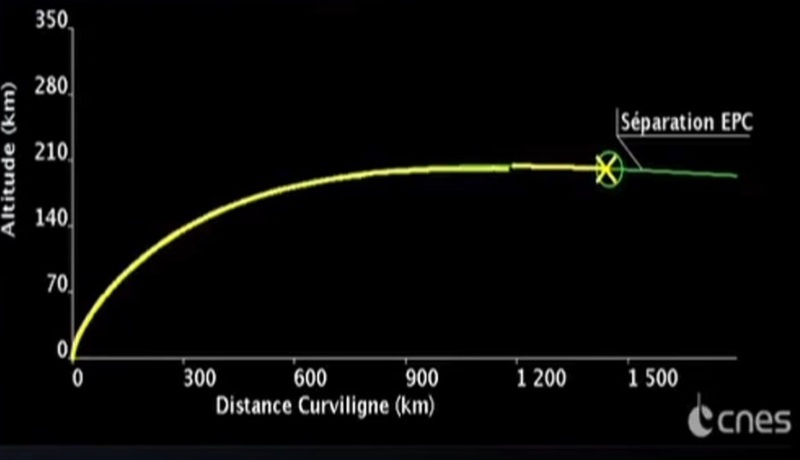 In the VA241 scenario, the Deputy and Chief Safety Officers would have been aware of the trajectory deviation within half a minute of H0 based on radar tracking while the Telemetry Officer would have provided them with a GREEN vehicle status across the board – Ariane 5 had stable propulsion, nominal body rates and the GNC system was showing a good trajectory. From an onboard status, there was no reason to terminate the flight and it would have been the sole responsibility of the Safety Officers to terminate the flight if Ariane 5 exceeded safety limits. The launch azimuth being just outside the Impact Line would explain why no flight termination was commanded in the first 40 seconds of flight which is the time frame given for a safe termination for missions from ELA-3. 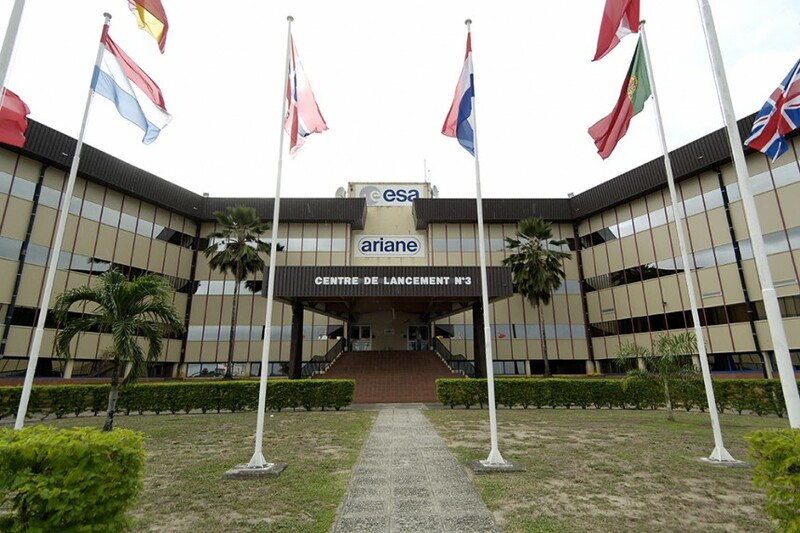 As Ariane 5 flew around 20 degrees south of its original launch azimuth, the components it shed during its climb to orbit – two EAP Boosters, two fairing halves & the EPC core stage – impacted well outside their designated crash areas, identified in Notices to Airmen & Mariners before the January 25 launch. As noted in the “VA241 Anomaly Update” posted the day after the event, the handling of the situation at the Jupiter Control Room was rather strange – at least to the outside observer. The live launch webcast provided by Arianespace showed the vast majority of people at Jupiter – including managers in the control area and guests in the viewing area – only became aware that something had gone wrong when the signal from the launch vehicle was lost nine minutes and 26 seconds after launch. Some of the technical staff in the “fishbowl” were seen pointing to screens around three minutes prior to that, likely the first to become aware of the trajectory deviation. Arianespace – during their launch webcasts – always advertises the people at Jupiter as the “decision makers,” so the question why no one recognized the potentially serious nature of the anomaly in real time is certainly appropriate. 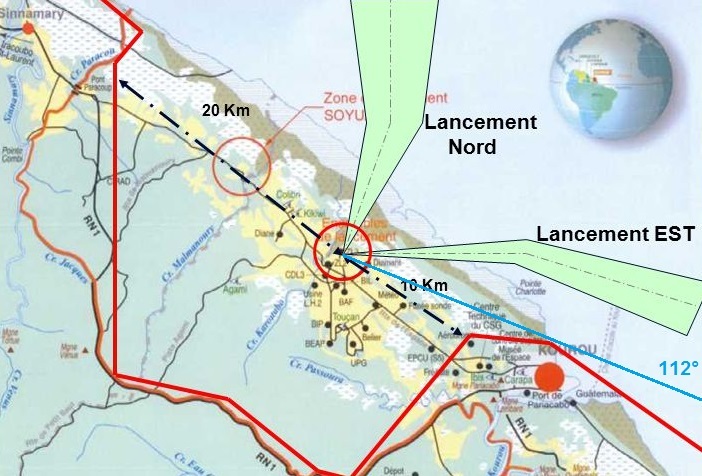 Studying the launch broadcast provided by Arianespace, it becomes clear that the anomaly would only be recognizable on one of the plots/maps available at Jupiter – if any. The nature of the anomaly meant that Ariane 5, at all times of flight, believed it was flying on the correct trajectory. Any altitude, velocity & downrange plot – even if using external inputs – would also appear normal since the vehicle’s propulsion & trajectory performance was very close to nominal. The only thing amiss was the azimuth and this, for the webcast watcher, was only visible in the small trajectory map appearing intermittently in the lower right of the screen. This also confirms the world map uses radar data to compute the position of the launcher, since the onboard navigation solution would display a nominal flight path. The trajectory map first appeared at T+2 minutes and 16 seconds and showed the yellow X denoting the vehicle’s actual position mostly aligned with the green circle representing the nominally expected position for every stage of flight. One minute later, the X is still mostly aligned with the circle and a brief glance would not lead one to think anything was out of order. At T+4:15, the X can be clearly seen south of the planned trajectory for the first time, but would require the focused attention of the viewer. The map is visible for eight seconds at T+5:33 and clearly shows the deviation and it again flashed over the screen for three seconds at T+6:26 when the X had almost completely left the circle. Something interesting occurs right around T+8 minutes. The Altitude vs. Downrange plot displayed on screen shows the yellow X denoting the rockets actual position vanishes at T+7:58 and re-appears at T+8:02. It would also appear from the plot that the vehicle was ever-so-slightly underperforming at that point. 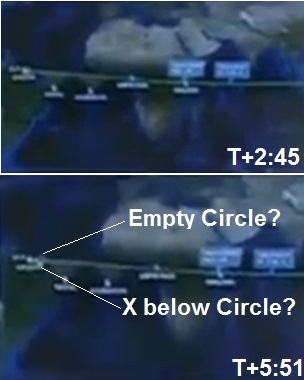 Unfortunately, the World Map was not on screen at the time and, when it showed up again at T+8:44, the cursor (X) was back in the center of the circle, indicating Ariane 5 was headed down the normal flight trajectory. The likely reason behind this is the transition from the Safety-Active Phase where Ariane 5 is tracked by three radars near the launch site and Range Safety has abort authority to the Safety-Passive Phase during which Range Control only acts in a monitoring function in assessing the Instantaneous Impact Point of the vehicle, but no longer acts in the event of an anomaly. (ref. H. Poussin et al. (linked above)). As the radars lose track of the vehicle, plot and map displays based on their data would have to switch to another source, either coming from downrange tracking radars (not employed by Ariane 5) or the vehicle’s navigation system itself. Ariane 5 was computing its trajectory to be nominal, explaining why the cursor moved right back to the predicted location on the World Map. The hint of underperformance seen in the data display just before T+8 minutes also vanishes and a small but distinct bend is visible afterwards. 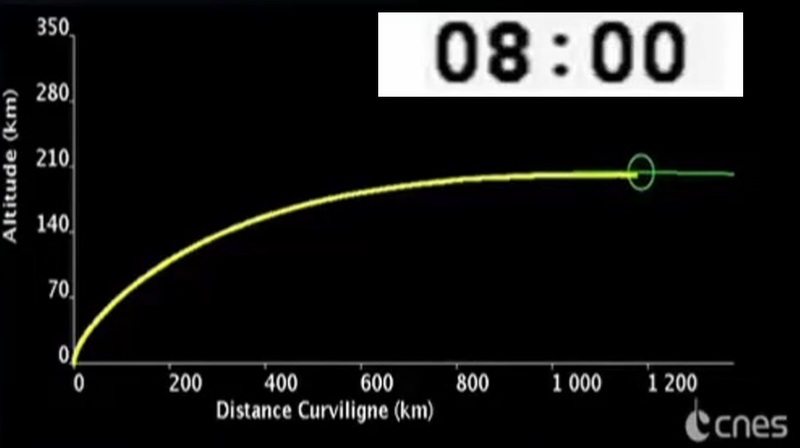 In reality, Ariane 5 was flying slightly under its Altitude-Downrange curve because its trajectory was not sticking to the equator where Earth’s rotation is faster than at higher latitudes and would normally “move the ground” underneath the rocket at faster speed than on its actual trajectory. 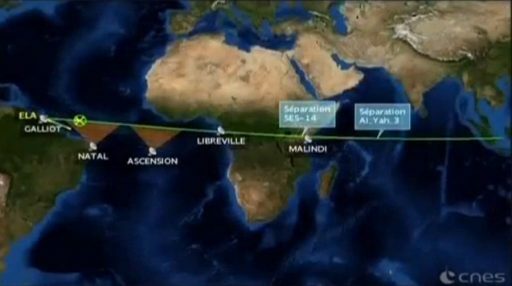 While flying its planned altitude profile, Ariane was not covering as much ground as it would have near the equator. This also explains the deficiency in orbital altitude at the end of the second stage’s operation which is consistent with the losses incurred by not flying along the equator. In summary, concerning Jupiter, it becomes clear that it would have been difficult to recognize the situation in the opening minutes of the mission. 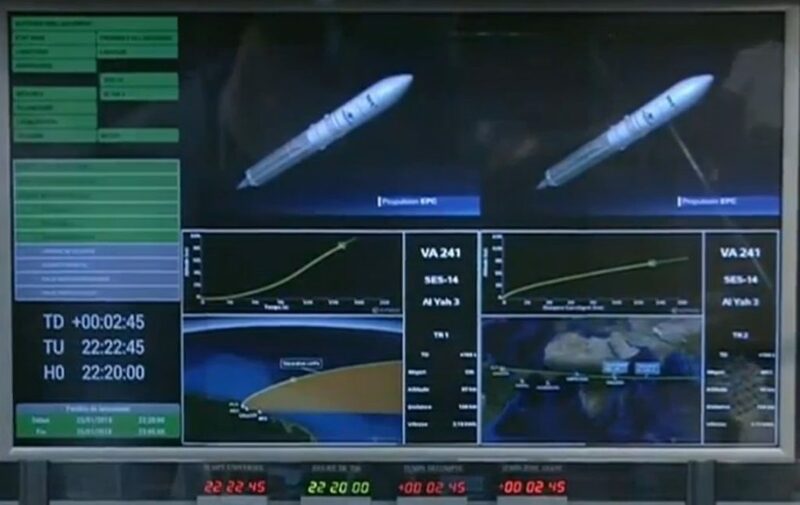 Only one of the front screen displays (the World Map) showed the deviating trajectory, the others indicated a nominal mission. Naturally, one would likely pay most attention to the animation displayed on top and the close-up map on the lower left as it shows more detail than the World Map – especially early in flight. As shown above, neither the simulation nor the close-up map was showing what was occurring. 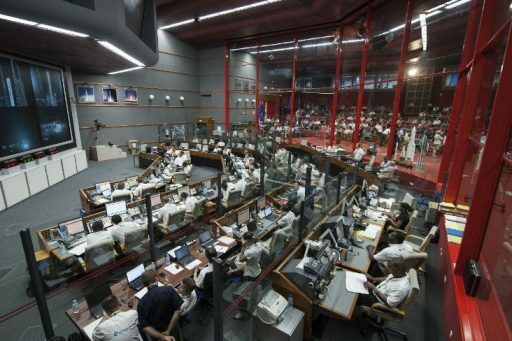 As shown in some perspectives of the Jupiter control room, a subset of managers was watching the Arianespace Webcast on their console screens, including the World Map in the lower right. However, as outlined above, this map only made the deviation obvious between T+4:15 to T+7:58 and when the trajectory issue was blatantly obvious, the map was only visible for periods of eight and three seconds – easily missed when looking elsewhere or focusing on conversation. It should be reiterated that the personnel at Jupiter are no controllers and therefore are not glued to their data. Telemetry does not appear to be flowing into Jupiter’s front room, at least based on the console screens visible on the webcast. The apparent lack of knowledge at Jupiter also showcases the communication paths at the CSG. Although the managers at Jupiter are usually referred to as “decision makers,” the actual controllers overseeing the countdown leading up to H0 are at the CDL-3 building close to the ELA-3 launch pad, operating from two shielded control rooms. Jupiter, particularly the Range Operations Manager DDO, receives information on mission status from the CVI – Contrôle Visuel Immédiat (Real Time Flight Evaluation) where the telemetry stream from the launch vehicle is analyzed in real time. 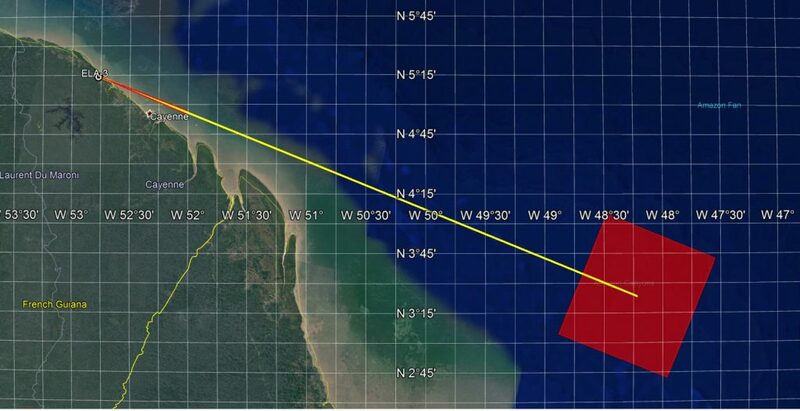 It is not clear whether the CVI tracks the azimuth of the vehicle based on outside inputs – the clear indication from the DDO reporting nominal flight events through the loss of signal would be no. 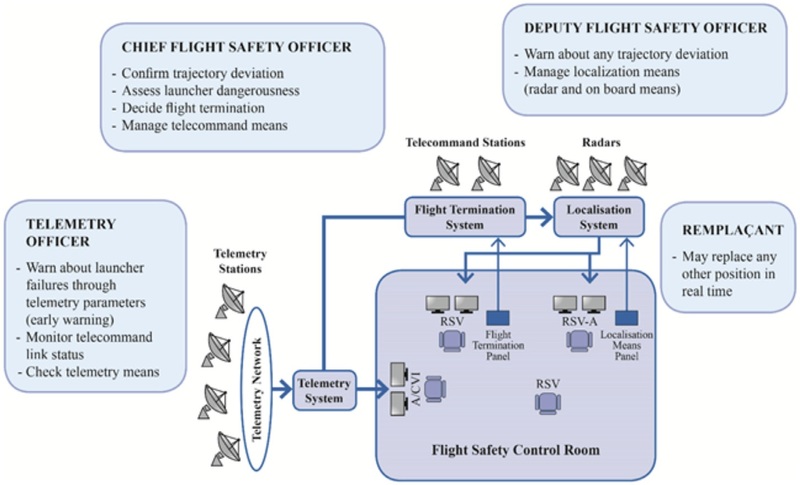 The four Range Safety Officers, who surely were the first to learn of the trajectory deviation, were on console “in a dedicated small safety room, fully independent from the main control center.” According to H. Poussin et al., communications within the safety team do not occur over a voice loop and employ a precise language protocol to convey the status of the mission via concise oral messages in order to accelerate the vital decision-making process ongoing in this area of launch control. Voice loops are used by the Range Safety Officers to communicate out to the localization, telecommand and telemetry teams. It can be assumed that the Range Safety Officers, after finishing their decision-making process following discovery of the anomaly, informed telemetry and tracking teams who can communicate with Jupiter depending on their workload which undoubtedly was on the high end with a vehicle committed to fly on an offset trajectory after RSO did not terminate by T+40 seconds. For the way public affairs managed the situation, an “F” grade would be deserved. 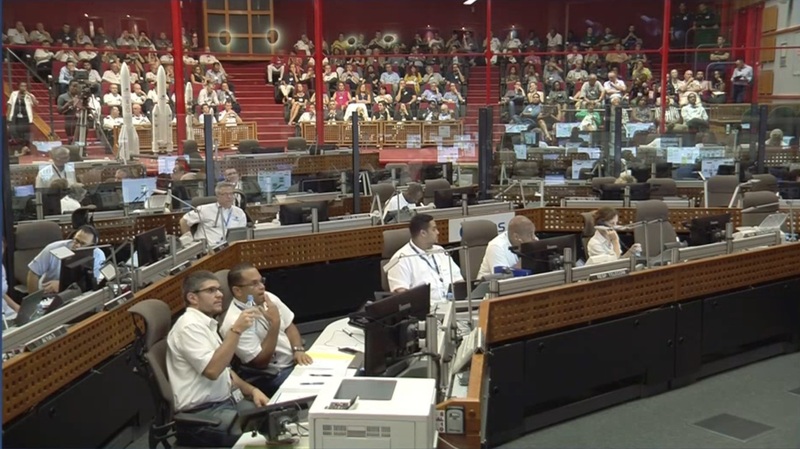 Both, the English Webcast Commentator Joshua Jampol and the @ArianeGroup Twitter handle, continued to report mission events as fact until T+33 minutes when Ariane 5 had been out of communications for 23.5 minutes. Even the successful separation of SES 14 was confirmed as fact on the Webcast, @ArianeGroup and Arianespace CEO Stéphane Israël’s Twitter handle which is typically controlled by public affairs personnel during and after launches. According to his Linkedin profile, Mr. Jampol “has since 1989 been the “voice” of Arianespace, handling live video commentary of launches of Europe’s commercial rocket from the spaceport in French Guiana.” Almost three decades of work related to Arianespace activities would rule out a lack of knowledge and point toward a company policy to keep a smiling face to the public until being told otherwise, but this statement only stands as conjecture without hard facts. The webcast eventually stepped away from the animation showing mission events ticking off like clockwork and paused at T+37 minutes until Stéphane Israël confirmed the occurrence of the anomaly roughly one hour after liftoff. While Ariane 5 may have gotten away with a black eye, skimming past a Loss of Mission, the two satellites it transported into orbit will now be tasked with making up for the botched orbital injection. 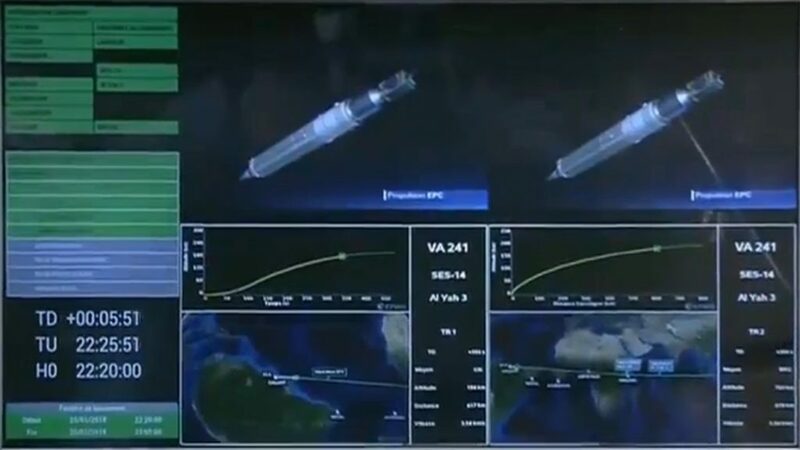 Luckily, both satellites achieved a stable orbit and were acquired by their respective ground stations shortly after launch, showing healthy systems telemetry. 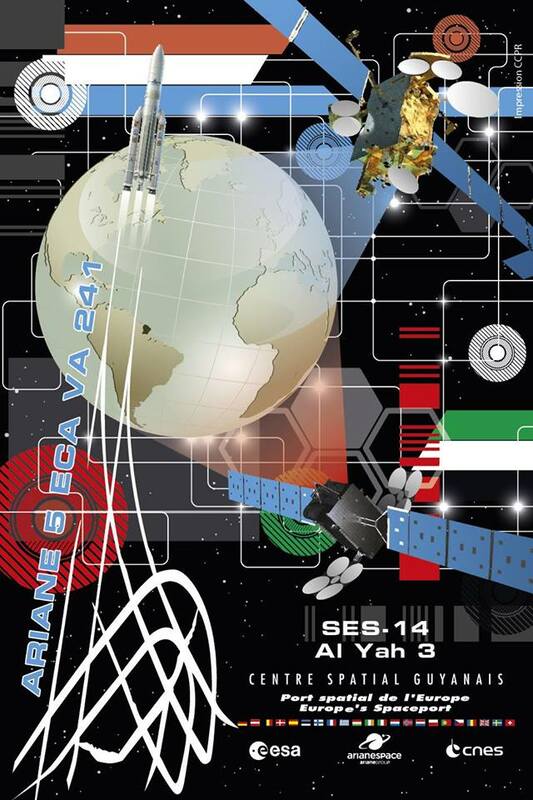 Both satellite manufacturers, Airbus Defence & Space for SES 14 and Orbital ATK for Al Yah 3, confirmed their satellites were in good condition and both were expected to reach their operational spot in Geostationary Orbit. 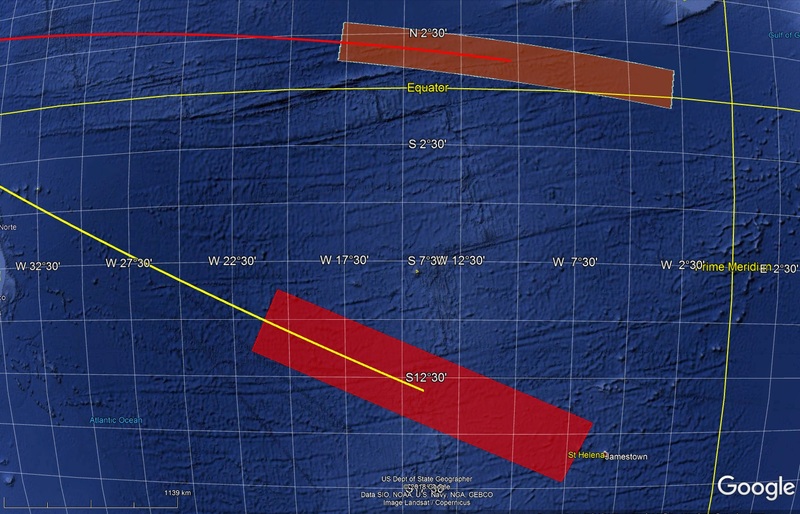 SES 14 apparently has the better outlook of the two. “SES announces that it has successfully established a telemetry and telecommand connection to its SES-14 spacecraft and is setting up a new orbit raising plan now,” the Luxembourg-based telecommunications provider said in a statement. 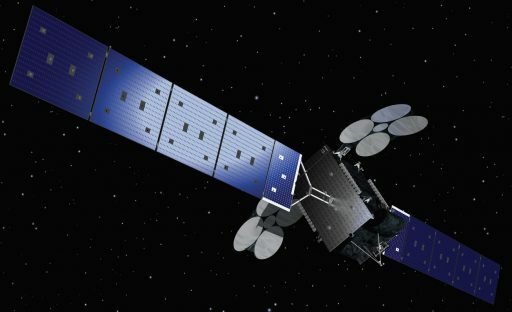 “SES-14 would thus reach the geostationary orbit only four weeks later than originally planned.” The company also confirmed that the satellite was expected to serve its full 15-year design life in GEO. 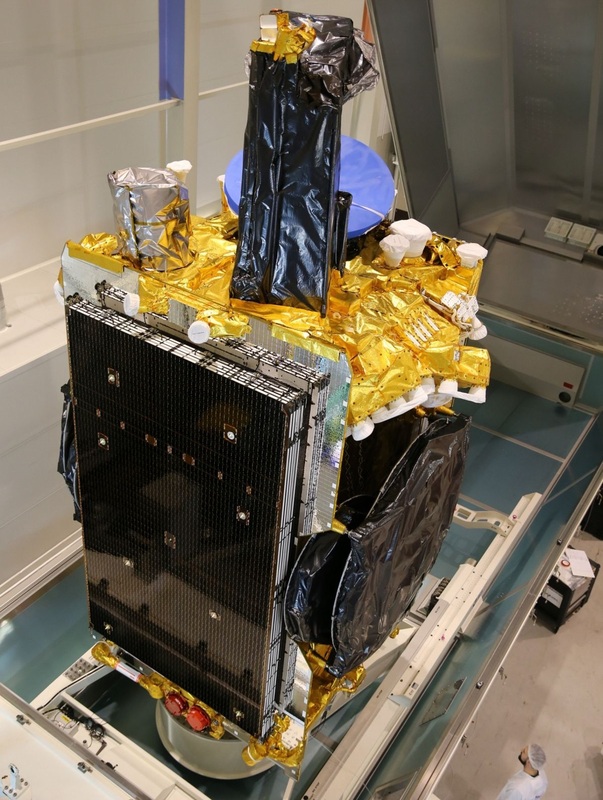 The SES-14 satellite is based on the all-electric Eurostar-3000EOR satellite platform outfitted with a PPS5000 advanced ion thruster system which has been ‘oversized’ to provide robust performance margin and allow for use on different satellite sizes/masses. Additionally, advanced performance characteristics like thrust vector control and a very broad operational envelope (for high-thrust or high-impulse modes as needed) will allow a flexible orbit raising plan to be developed for SES 14. SES 14 already conducted an initial orbit-raising campaign, lifting its perigee by some 100 Kilometers to 336 km and decreasing its inclination by 0.1 degrees. This was likely done as a precursor maneuver to move the perigee to less-dense layers of Earth’s upper atmosphere to reduce the drag environment encountered during perigee and so preserve the orbit’s apogee altitude while teams develop future maneuver plans. The major disadvantage for hybrid satellites is that, typically, they have to execute all main engine burns before the ion thrusters can be used effectively as the solar arrays can not be fully deployed due to loads experienced during main engine firings. The trouble arising for the two satellites is not found in the slight altitude deficiency or inclination error of the achieved 232 x 43,163km, 20.64° vs. planned 250 x 45,000km, 3.0° orbit. These factors will only add 165 meters per second of change in velocity (delta-v) for the satellites to reach GEO – easily achievable with performance margins. 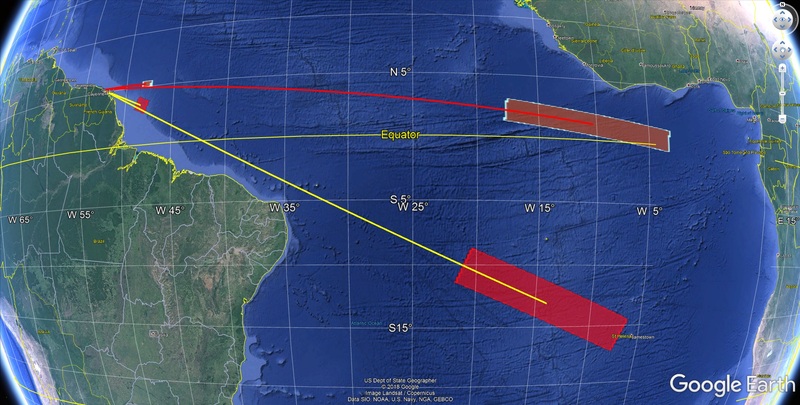 The major problem is that Ariane 5 failed to inject the satellites into an orbit with the perigee and apogee located over the equator (argument of perigee planned at 178° but actually at 229°). Instead, Ariane 5 injected the satellites into an orbit with apogee at 16°N and perigee at 15°S. Rotating their orbits back to the correct geometry would cost the satellites up to 1,100m/s in delta-v (worst case) or require patience. 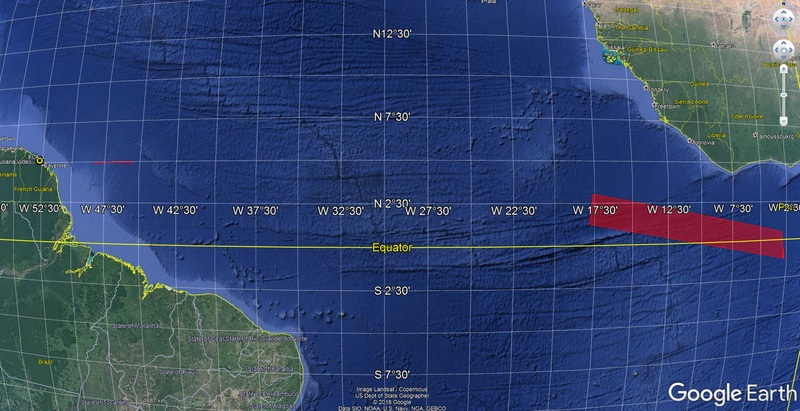 The orbit naturally precesses and will eventually end up with apogee and perigee close to the equator – per current tracking elements in mid-September 2018. At that point, a fuel-efficient transfer at a net penalty of not much more than 165m/s would be possible. It remains to be seen what type of recovery plan the two satellite builders will select. Copyright © 2019 Ariane 5 VA241 | Spaceflight101. All rights reserved.